Two years ago, The Scotsman joined candid indie troubadour Aidan Moffat plus film crew for a gig at the Faslane Peace Camp as part of a Festival 2014-funded road trip around Scotland, during which Moffat took a crash course in traditional song from local practitioners and attempted to add to the canon in his inimitable uncensored style. 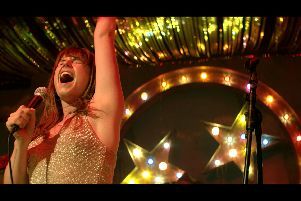 The finished film, Where You’re Meant To Be, received its Glasgow Film Festival premiere at the original tour’s final destination, the venerable Barrowland ballroom. It’s an offbeat off-road movie in which the frequently bemused Moffat meets rival Nessie hunters, battle re-enactors, lonely widowers and the indomitable Sheila Stewart, who is singularly unimpressed with his efforts to update and urbanise her beloved ballad tradition. Moffat is a confirmed town mouse, and it is in the cities that his concerts are received warmly by confirmed fans. This contrasts comically with Moffat out of his comfort zone, braving the coastal elements and gamely sticking to his musical guns in front of baffled audiences across the Highlands and Islands. Moffat’s voiceover in the form of an address to Stewart, who died shortly after filming was completed, is an attempt to impose some sort of structure on a rather random set of encounters, bound together less by the music than by common humanity - and humour. The songs took centre stage in the second half of the event when Moffat was joined by his band and travelling companions – Twilight Sad frontman James Graham, violinist/vocalist Jenny Reeve, pianist Stevie Jones and accordianist Michael John McCarthy – for a trim run through some of the music heard in the film. Bothy balladeers Danny Couper and Geordie Murison opened the live proceedings with a couple of anti-Polaris songs from the 1960s, Glasgow Eskimos and Ding Dong Dollar. Moffat’s songs were more concerned with the personal than the political, though he did gingerly resurrect his referendum-inspired I Love An English Lassie, with apologies to Harry Lauder and the entire English race. The tougher crowds on his tour have chastened Moffat somewhat. While he performed the songs unabridged in all their ambivalence, he did feel the need to make a number of public service announcements, cautioning on content. Still, I’m A Rover, the catchy tale of a wasted womanizer, was dispatched with almost as much revelry as revulsion. Having been chastised by Stewart on “blootering” the context of the traditional songs, he hedged his bets on Big Kilmarnock Bunnet, unsure if his reading of the original justified his tall tale about being tricked into a liaison with a prostitute. The bawdy irreverence took a back seat on Jock McGraw, a dark tale of post-traumatic stress over the sweetest tune, but re-asserted itself on the gleefully profane Ball of Kirriemuir. Moffat was less comfortable with a straight take on McPherson’s Farewell, while the poignancy of The Parting Glass fell apart due to onstage hilarity. Perhaps traditional music is not where Moffat is meant to be but it was worth taking the trip to find out.